One of the prominent Quran reciters in Egypt. 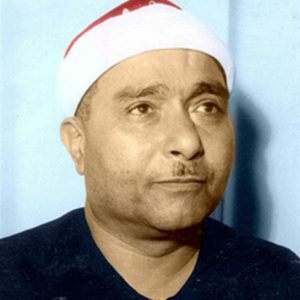 Sheikh Mustafa Ismail was born in June 17, 1905 in the small village of “Mit Ghazal” in the center of Tanta in Al Gharbiya Governorate. Sheikh Mustafa completed the memorization of the Quran in his village at the age of twelve, and then he joined “Al Ahmadi” mosque in Tanta to master the sciences of Quran readings and Tajweed. Sheikh Muhammad Ref`at had predicted for him a very bright future after having listened to his recitation and reading methods. At first, Sheikh Mustafa Ismail became famous in all parts of Al Gharbiya Governorate and neighboring Governorates before one of his friends advised him to go to Cairo to try his luck there. He also had the chance to recite the Quran in a big celebration due to the absence of Sheikh Abdelfatah Ash-Sh`shai. Sheikh Mustafa was appointed as a reciter of the Quran in the royal palace during the reign of King Farouk I, and thanks to that, he became famous in various Arab and Muslim countries. Sheikh Mustafa passed away on Friday, 12 December, 1978.